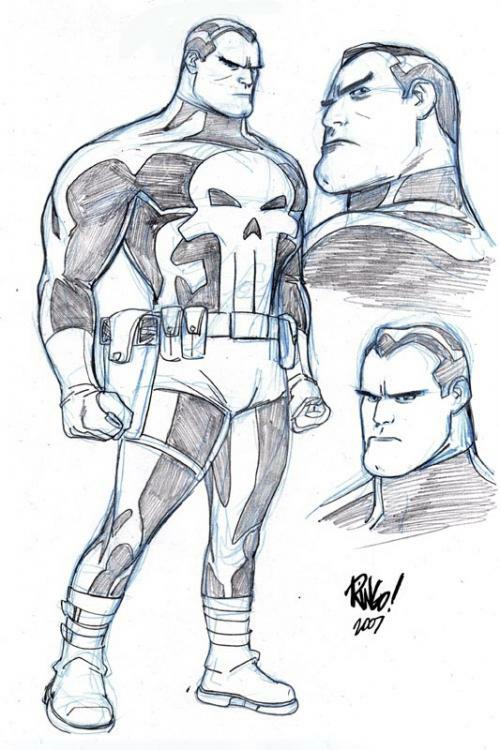 PUNISHING MONDAY - The Official Webpage of Mike Wieringo! ¦ The Official Webpage of Mike Wieringo! I’m going to have to make this a quick on this morning…. deadlines are beginning to feel like a vise around my neck. I thought it would be interesting to draw a character that I’ve only drawn, I think, one time before. That was for the cover of a trade paperback collecting stories from several Marvel characters. I don’t remember the name of the trade… but I remember that THE PUNISHER was one of the characters I had to draw. Since then, though, I don’t think I’ve ever had the occasion to draw him for Marvel again. So for today’s sketch, I decided I’d draw Frank Castle… especially since he’s one of those dark, gritty street level characters I’m certainly not known for drawing. It’s also a BIT topical in that Thomas Jane has pulled out of reprising his roll as PUNISHER in the coming sequel. Since the first one didn’t do all that well, I don’t really see what the big deal is…. but I’m grasping at straws for a connection. OK… back to the salt mines…. This entry was posted on Monday, May 21st, 2007 at 1:05 pm and is filed under Uncategorized. You can follow any responses to this entry through the RSS 2.0 feed. Both comments and pings are currently closed.